The sweaty ‘hell’ season is well and truly over and its now time for the spooky crisp season to begin. The spooky season is truly one of the best times of the year. We’re not worried about a midnight spectral visit though. There is something WAY WAY WORSE than a midnight spectral visit!! It’s going bump in the night..lingering in the background..only revealling its full destructive nature AFTER the festivities have ended. YES! We’re referring to the large quantities of waste left in the wake of the spooky season. Dublin City Centre is already FULL of devilish Halloween PLASTIC décor.. you can’t miss it.. it’s right next to the devilish CHRISTMAS PLASTIC décor. It’s terrifying!!! Sometimes it seems near impossible to do the right thing and avoid plastic waste. Let’s throw it back to the days of the Samhain and remind ourselves what the Spooky Season is REALLY about followed by some tips to help you make a few BETTER CHOICES this year. Halloween came from the ancient Celtic festival Samhain. The festival of Samhain is said to be over 2,000 years old and used to celebrate the passing from summer to winter. Samhain marked the end of the final harvest of the summer, and all apples had to have been picked by the time the day’s feasting began. The Celts believed that during the festival of Samhaim the veil between this world and the next world was particularly thin, allowing spirits to pass between the two worlds on this night. People would disguise themselves using animal skins to protect against evil spirits on the prowl and lit fires to guide the good spirits during Samhain. Households would also carve scary faces into turnips and leave it at the doorstep to ward off evil spirits. The celebration also carried the notion of casting out the old and moving into the new. Flash forward to Halloween in the year 2018 and how would you describe the festivities? While there is still great fun and celebration we seem to be reluctant to free ourselves from unsustainable behaviours. This time of year presents a great opportunity for all of us to cast out the old and move forward into a new year of better choices and fighting for a planet that will keep sustaining us and future generations. In 2015 we learned that there is such a thing as an unnecessary journey and when to avoid taking them – major thanks to Teresa Mannion. It may be the spooky season, but there’s no dressing up the extreme weather Ireland has experienced of late.. 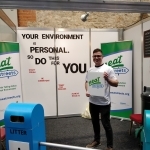 Speaking at the Environment Ireland Conference on the 4th of October 2018, Director General of the Environmental Protection Agency, Laura Burke said, “we have, by any measure, experienced an extraordinary year where nature reminded us who is in charge”. Not only are we facing changes in our weather if we continue inaction on climate change but we will also have to pay millions in fines for not meeting our climate action targets set by the EU. We know that global temperatures are rising rapidly due to greenhouse gas emissions. We know that this is causing changes in our climate. We know that we only have 12 years to avoid disastrous climate change. We also know that one sector that contributes to this rapid increase in emissions, is the waste sector. Everything that is made generates emissions from production right through to disposal. That’s why, at Neat Streets, we’re all about promoting and encouraging young people to make BETTER CHOICES. By making a better choice we can all help in our small way to reduce our emissions by reducing our waste. BUT WAIT! The responsibility doesn’t fall on our shoulders alone! While making these small changes as an individual we also need to ask industry to stop producing plastic and unsustainable products and to ask our Government to support these changes. 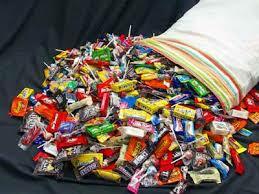 So… what are some OBVIOUS better choices you can make at Halloween? So you’ve been invited to THE Halloween Party and all you can think about is WHAT POP CULTURE REFERENCE CAN I DRESS UP AS – OMG! My general approach to a costume has been to try make an effort with items that I already own. This is in part due to laziness, but also, I’m always trying to be a bit more eco friendly myself with each thing I do. So…think of an idea and then look in the wardrobe and see if you have any items that you can piece together. Goggle images and Pinterest are your friend for getting ideas or copying an outfit or character. There’s nearly always something in your wardrobe and if there isn’t there’s the option to borrow an item from someone else! The beauty of doing this is that you save money, the clothes will all be worn again, and you’ll look better than buying a crappy costume you’ll only wear once anyway. 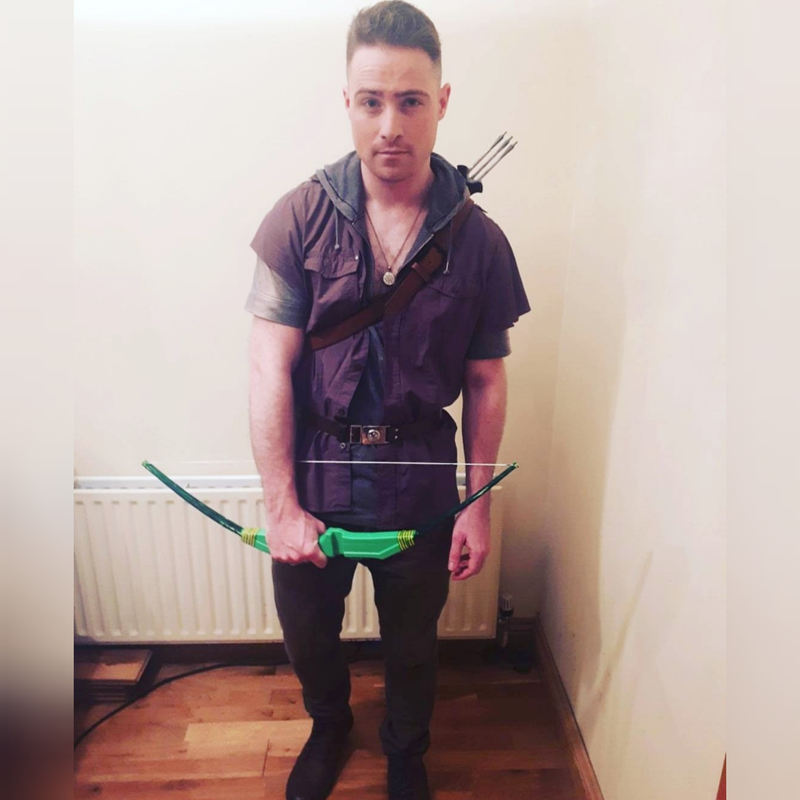 So I’ve dressed up as Robin Hood twice in my life. Once when I was 17 and then again last year (FYI to the spooky season police: Don’t worry, I’m already aware that robbing from the rich and giving to the poor doesn’t naturally send chills down the spine!! but hey, we don’t all have to dress up as fresh death). The only difference is that the outfit actually evolved and improved in 2017!!! So let me break it down for you. I’m wearing brown kind of boot style shoes, dark green chino style trousers, a light grey sleeveless t-shirt hoodie, a brown shirt, and a belt to strap across my chest and shoulder. I already owned all of these items. The only effort made here was cutting the sleeves off of a brown shirt I had for years but knew I would never wear again and SHOULD NEVER wear again (god it was awful Lol). I still wear these items during the year and mix and match with other items of clothing. Now… let’s address the elephant in the room.. or my hand… I did buy a plastic bow the first time I attempted Robin Hood so technically I’m REUSING IT. Going forward, I wouldn’t buy something plastic again because it actually wasn’t needed. People get the point as to what your dressed as and it was annoying as hell to carry around. This year, I had the same thought process trying to choose an outfit from items I already owned. I looked up a picture of a Quidditch player and tried to do my best version of that. So let me break it down for you. The scarf was bought in London literally at PLATFORM 9 and 3/4. You can be damn sure it’ll be worn again. The Gryffindor jumper was an impulse buy whilst being a massive nerd and browsing in Game Stop (SEE.WANT.BUY). I might not wear it ALL the time (there’s a giant Griffyndor Crest on the back it’s NOT subtle) but I would wear when cold in the house or when I go camping. 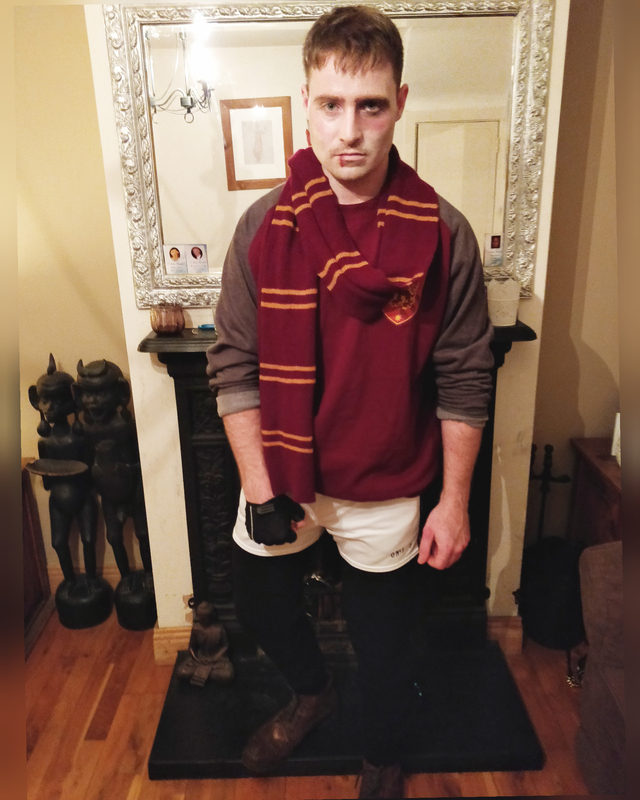 I wore black cotton tracksuit bottoms, and over them, my Rugby shorts. The brown boot style shoes are the same as the ones I wore for Robin Hood. I did buy a small container of face paint for €2 to create a black eye and cut lip which I’ve kept safe for use again. Again, they will probably look better than crap you buy in store. For example, in my house, we collect leaves from the ground outside and put them along the window and we try to reuse other materials to decorate the driveway and house. Everyone has grown up in my house so we would be decorating for the young people who live on the street who go around trick or treating. Consider what packaging products come in – avoid purchasing products which have an abundance of packaging. It will only fill landfills or be incinerated. Cloth and canvas shopping bags are so common these days this is a no-brainer replacement for plastic or paper bags. 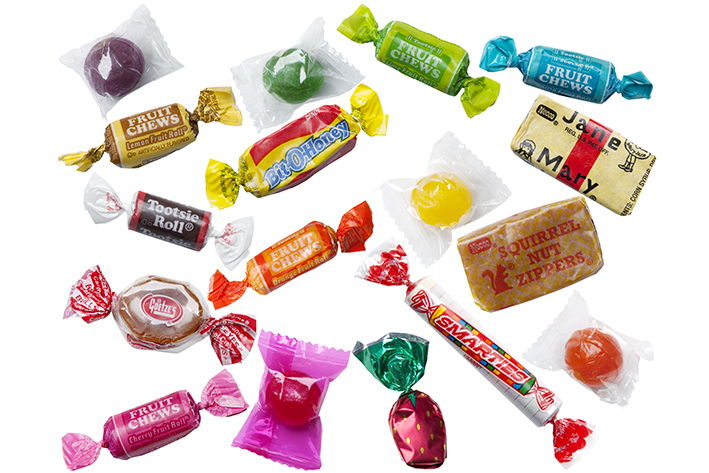 If you secretly hope your brother or sister gathers some candy for you – and who wouldn’t? – pillowcases make great carry bags, they’re washable, REUSABLE, and if you have a queen or a king-sized one, will hold way more loot than a shopping bag. Steer clear from those moulded plastic jack-o-lanterns sold this time of year. Although they are re-usable, they are still made of – well – plastic. Marine Scientist believe that there will be more plastic in the ocean than fish by 2050, and much of that is eaten by fish, birds and other marine life. Having a Halloween party? Why not make it green-themed right from the start? Serve homemade foods, use dishes and cutlery instead of disposable plates and plastic forks and knives. Seriously, no one is going to care that the cutlery isn’t coloured orange and black.. but the fish in the sea will!!! We probably won’t need to remind you to also ditch the straws!! SEE… it’s totally possible to be a bit green during the spooky season!